The emergence of new fire service technologies has become a recent focus in the fire industry due to digitization. However, the industry has been occupied by waves of technological advancement for centuries. With each wave, fire service sets a new milestone, signifying an influential contribution to firefighter operation and protection. Technologies that transpired from tech waves in the industry include fire helmets, breathing apparatuses, water throwing engines, and personal alert safety systems (PASS). These equipment and resources developed initially as individual components. However, after high level integration into fire service operations, these technologies contributed to an evolution toward a higher functioning fire fighting system. Similarly, this new wave toward analytics can do the same. Technology Trigger. The first stage is signified by a technological breakthrough. This often pairs with proof-of-concept stories and hopefulness toward development of a usable, commercial product. Peak of Inflated Expectation. Due to publicity of the technology trigger, this period of time is marked by numerous success stories, accompanied by scores of failure. 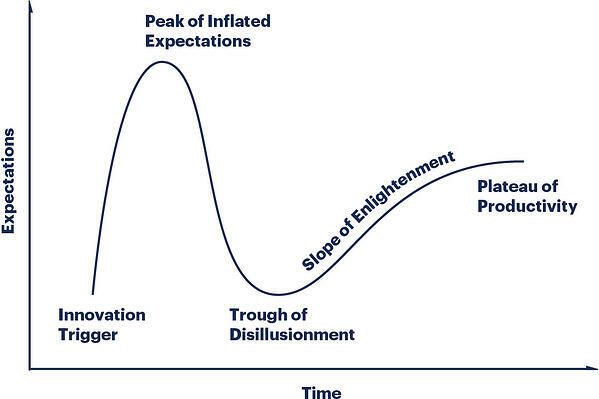 Trough of Disillusionment. Interest and excitement from the breakthrough wanes due to failure from experimenters and implementers to produce favorable results. Slope of Enlightenment. More instances of the technology’s benefits crystallize and become widely understood. Next generation products appear from technology providers. Plateau of Productivity. Mainstream adoption of the product takes off and continues to grow within niche markets. Criteria for assessing provider’s viability becomes defined. Data analytics is gaining momentum. The current tech wave has fallen into the slope of “Slope of Enlightenment” and the industry is beginning to narrow in on Cloud computing and accessing the viability of providers. Industry professionals are looking to streamline data analytics with fire management systems, and determine effective and efficient ways to process data for real-time application. Many organizations have implemented a system for digital data collection, however there are gaps when it comes to transferring information across agencies and departments. Access to interoperable data enables fire professionals to make educated decisions, and facilitates automated analysis. Information such as turnout time, travel times, dispatch metrics, outcomes, population density, demography and geography, benefit many layers of operation within the fire service when in conjunction. The IAFC Western Fire Chiefs and Intterra have created a long term project to help the fire service use collaborate and share data. Using Fire Data Lab, different fire departments can stream live data, anonymize data sets, and develop more advanced analytics. Together, the enterprises hope to acquire a master data set and create a community with the proper tools and framework to excel the industry, and any academia surrounding it. As communities continue to be brought together, innovators like Intterra will be able to effectively drive the advancement of analytics usage toward developing solutions for the fire industry as a whole. Interested in working with a common data platform where your organization can implement this best-of-breed technology? Click here to find out more.